If you are interested in opening an ice cream business, you will have many decisions you will need to make. The first and most important decision will be to pick an ice cream shop style for your store. Be it an ice cream truck, a self-serve ice cream parlor, a gourmet ice cream shop or a novelty ice cream shop, there are many different types of ice cream parlor styles, and understanding the differences will help you choose the one most suitable to your style and budget. The simplest type of ice cream business is often one of the most popular styles around. An Ice Cream Truck offers your customers an opportunity to order their ice cream while standing outside the Ice Cream Truck window, at a convenient location. The workers prepare the ice cream order inside and hand the finished product out to the customer. This type of setup is popular because it is incredibly cost-effective. The entire ice cream operation fits inside a small trailer or truck.and can be completely mobile. You can move your ice cream business from location to location throughout the day, so that you never have to experience customer stagnation. 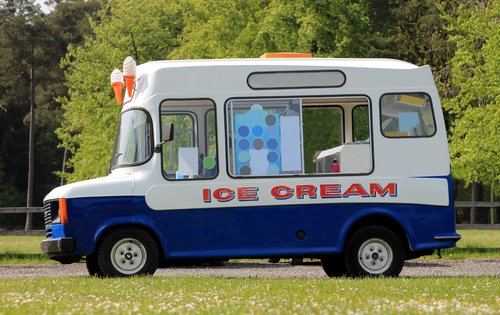 It is also popular to have a Ice Cream Truck because there is no need to maintain restaurant facilities such as a dining room,, tables, or chairs. Ice cream restaurants do not necessarily generate more business then ice cream trucks. Avoiding the costs associated with running a sit down shop may be an appealing thought for an ice cream parlor entrepreneur. Another type of ice cream shop that is dramatically increasing in popularity is the self-serve parlor. In this type of ice cream parlor, customers fill their own containers with soft-serve ice cream and add the toppings and sauces they want. Ice cream is usually sold by the ounce, so customers that fill their ice cream to the brim will pay more than those who select a small sample. Depending on the type and quality of toppings you offer, customers may be inclined to fill their containers with goodies and pay a higher price. Many customers like the freedom to create their own ice cream concoctions and don't mind paying more for this privilege. A gourmet ice cream parlor is quite different from an ice cream truck or a self-serve parlor. This type of setup is designed to appeal to "foodies" and gourmet aficionados. Classy décor is paired with high quality ice cream flavors and products. For example, the popular Marble Slab ice cream parlors feature a super-cooled slab, marble or other stone that is used to mix toppings into a selected ice cream flavor. These parlors usually feature ice creams that are in a higher price range, so are likely do better in affluent locations. Another type of ice cream parlor setup is the novelty ice cream parlor. This type of ice cream shop features a décor theme or a "gimmick" that makes it stand out from other ice cream parlors. A 1960s décor theme, for example, may include records on the wall, a jukebox in the corner, and ice cream that is hand-delivered by wait staff on roller skates. The ideas for a novelty ice cream parlor are limitless, and by using this type of setup, you can be quite creative in finding a unique way to market your ice cream.